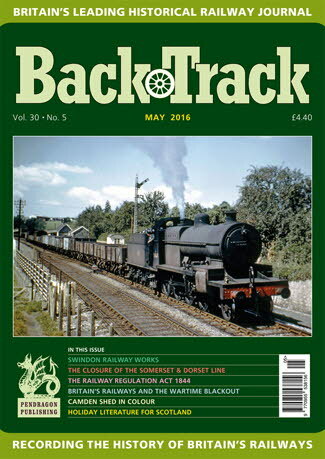 Railway Magazine | BackTrack May 2016 journal from Pendragon Publishing. Observations at Bentley Heath - colour spread of Michael Mensing's colour photos on the GWR Birmingham main line near Solihull. The Railway Regulation Act 1844 - John L. Flann considers politics, economics and Government control in Victorian Britain. Past and Present Track Formations - Part Two - Michael B. Binks concludes his survey of permanent way principles. Holiday Literature for Scotland - Alan Bennett shows how the LMSR and LNER aimed for the tourist market in the 1920s/30s. Class 47s Stratford Style - some colourful offerings on the Great Eastern line photographed by John D. Mann. Bullion Thefts from the Railways - more crime on the lines revealed by Alistair F. Nisbet. Following in the footsteps of Flight Lieutenant Aidan Fuller - Roger Smith remembers the 'British Locomotive Shed Directories'. Swindon Railway Works - Stephen Roberts takes note of the great place's 175th anniversary. 'Through a Glass Darkly' - Dr. Malcolm Timperley writes about Britain's railways and the Wartime Blackout. The Closure of the Somerset & Dorset Joint Line: Part One - 50 years on, Edward Gibbins takes a hard-nosed look at the case for closing it. The Slate Quarry Engines - Some historic Welsh narrow gauge photographed in 1961 by Dr. Geoffrey Smith. B1 Experiences - colour spread of the LNER mixed traffic 4-6-0s. Wings over Cambridge - Geoffrey Skelsey describes what is revealed in a remarkable aerial photograph from 1922.